All vehicles must meet APPLICABLE FMVSS. The key word in that sentence being applicable. As in if a vehicle is excluded or exempt from a requirement, then it doesn't need to meet that FMVSS. Pre 1965 for pollution control devices.This is in conflict with the ARB requirements of 1967 and earlier are exempt. You have to love multiple conflicting dates on things. Speedometer in kilometers is legal. 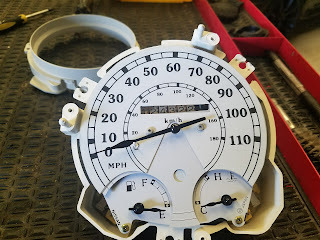 Nissan Fiagro Speedometer with a MPH overlay. Even though it isn't a requirement, drivers in the US often want a MPH speedo. Right hand drive is legal as long as it has a turn signal system, and an outside rear view mirror on the left side is required. We wonder if they make 1910's-1920's Buicks adhere to these standards.